Local search is broadly used to describe customers looking online for businesses near them. It can be on a desktop computer, laptop, tablet, phone or even a home assistant device such as Google Home or Amazon Alexa. Regardless of the business search or device used, there are factors that control how and why one business is visible and is “recommended” in search results over another. Your business can be the business that gets found. There are multiple sources of local business information for your company besides just your website, Google, Facebook and Yelp. Your business information needs to be accurate and consistent on as many of those sources as possible. There are some sources that are more important than others. There are hundreds of online directories that can list your business information. A well-known directory is Facebook, where many businesses have set up a business page listing their basic info and services. These directories are like business cards sitting out in dozens and dozens of locations. Just like your business card, they list your business name, address, phone number and website, among other information. Given the number of listings of your business online, it is vital that your business information is accurate and complete. Incomplete or missing info on one or more of these directory “business cards” can sabotage your promotion and expansion efforts. Customers may not be able to reach you, know where you are located, or even if you are in business. If your business has changed address or phone numbers, it’s probably showing incorrect information in dozens of places. But did you know many directory listings allow customers to create a listing ON BEHALF of a business? Yelp and Facebook for starters. Customers can create a page for any business, such as by “checking in.” Or, simply creating a page. I’m sure you love your customers. But do you love them enough to give them the keys to your online marketing? A happy customer wanting to promote your business can easily type in an incorrect phone number or other important detail. They probably won’t quite be as thorough as you might like either. Any error in one directory can move around the Internet. It also can conflict with the right information that YOU set up such as on your Facebook page. So now search engines are conflicted. Someone asks Google “What’s a good restaurant in my neighborhood?” Google is an unthinking machine with answers that are ultimately YES or NO in terms of the recommendations it makes. YES, here’s a restaurant. If your information isn’t accurate and consistent across the web, Google doesn’t “trust” your information, so the answer is very likely to be a NO. Now your business isn’t nearly as visible and “findable” as if it’s information was correct out there. There are many potential errors, but there is one simple solution. That is to go through your directory listings and fix all those errors and fine details. Which listings? Glad you asked. There are directories that are more important, because they actually provide information to other directories. In the U.S. there are four main Data Aggregators. Aggregate is a computing term, meaning “collect (related items of content) so as to display or link to them” (Oxford-American Dictionary). The four aggregators are Infogroup, Acxiom, Neustar/Localeze, and Factual. These companies collect local business information, then use their additional resources, data and analysis to verify that information. They provide that information to other directories and sources. Of important note is that search engines like Google and Bing license that data. Facebook, Yelp and Yellowpages can also send data about a business to search engines and even other directories. So if your business data on any of these key sources is incorrect, it can spread like a bad rumor and create confusion in the search engine and provide inaccurate results. In a nutshell, having inaccurate, incomplete directory information can negatively impact your ability to rank in Google, Bing and Map Applications. Threads Embroidery, based in Austin Texas, purchased the Extensive local marketing package in 2017. #3 in the organic results, just below Yelp and above Thumbtack, two companies with a sizable marketing expenditure. We do detailed research to review the key sites where your business is listed and then handle, correct and clean up your business information until it is 100% complete. Services like Yext claim to do this for you, but you have to pay every month. Their methods often include just “suppressing” incorrect information for only as long as you pay them. If you stop paying, those bad listings can revert, putting you back where you were. The services below are a one-time investment. They are thorough. Incorrect listings are fixed. Duplicate directory listings are removed. Afterwards you own all your listings and the username and passwords to access them. For every listing you request you will have full control. This is a core online investment your business. An investment with a long-term positive influence on your local search visibility. Every package comes with a detailed report on the directory status and ongoing recommendations to maximize your improved local search position. Ready to Take Control of Your Local SEO? Use the form below. You can also simply ask any questions if you’d like more information. What Information Does My Business Need To Provide? Every project begins with your business providing extensive information on a project worksheet. This includes basics like official name, street address, phone number, and website. It also includes your services and products, keywords that you want to be found for in local searches, links to your social media profiles, photographs of your key staff or office, etc. The worksheet is detailed by necessity so that every directory listing can be checked and thoroughly handled. How Long Does the Directory Audit and Cleanup Take? Once we have a fully completed business information worksheet, your package will begin and we estimate 6 weeks for completion. What happens after it's done? What do I need to do? When a Local SEO package is completed, we’ll send you a comprehensive report showing where every listing stands. For example if incorrect listings were updated, if duplicate listings were removed, etc. As well this report includes all usernames, passwords and log in locations for every directory listing correction ordered. So moving forward you can update any and all listings as you see fit. It’s your business and you now own that much more of it’s presence online! Know others who can benefit from this information or service? They'll be happy if you share it! I’ve personally reviewed and analyzed hundreds of business websites in dozens of industries. I see business websites making the same mistakes. 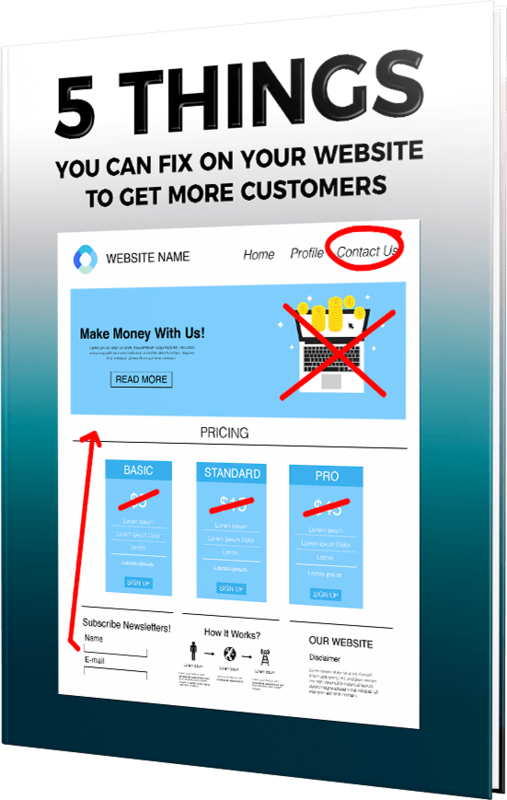 Website mistakes that cost them customers, sales and income. I wrote a free step-by-step checklist you can use to improve your website by next week. This is in simple language and these are simple fixes. You can download yours today and help your tireless, works-around-the-clock salesperson do a better job for your business. Here’s to a prosperous 2019 for you! © 2019 Countdown Web Design. All Rights Reserved.